The Karalee Tornadoes are a local community and family focused club located at our grounds, Blue Gum Reserve, in Karalee, found in South Queensborough Parade. We have 2 full sized international fields, canteen facilities, clubhouse facilities and covered areas. Our training equipment is new, our coaches are well trained and our family atmosphere is welcoming to all. The Tornadoes have been in the Ipswich Rugby Legue competition in the Junior grades for over 17 years and in 2013 will have our first Senior Mens teams entering the local Senior grade competition. Our club motto is Fun, Fitness and Friendships and our managment and parents all stive to ensure that all players, regardless of their abilities, are treated fairly and get an equal opportunity as those wanting to make it in the NRL. Per Capita we have the highest selection of players in the junior Representative, Development teams and Coaching ranks within the Ipswich League region and we are very proud of our abilities to develop players and staff to these levels. We focus on skills and personal development and that flows through the teams and culminates into positive results each and every year. 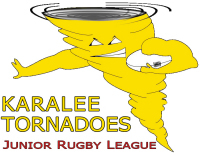 Please visit our main website at http://www.karaleetornadoes.com.au for more information on the club and how to contact us.